The PA-SI-1 Speaker Interface is a 1 Watt Utility Audio Power Amplifier designed with the System Integrator in mind. The input is transformer balanced allowing several PA-SI-1’s to be connected in tandem. Power comes from the PA-BUSS, to simplify wiring. The audio quality of the PA-SI-1 is superb. The undistorted output is 1-Watt. The PA-SI-1 is fully protected against overloads. The unit automatically recovers when any overload is removed. Modular Construction makes the PA-SI-1 ideal for integrated designs. The unit is small; mounting is flexible, and easy, so it is ideal for space conscious requirements. Mounting options include Snap Track or stud mounting. All signals are connectorized for ease of installation. Power is from the Tech Works PA_BUSS connector. 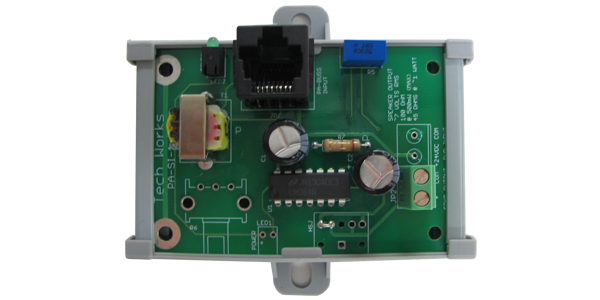 A current limited 24 VDC comes in on the same connector as the audio from a variety of Tech Work CI-BUSS and PA-BUSS products.